EDIT (December of 2017): This blog post was originally published in 2011, and is based primarily on my experience working with my late voice teacher, Lynne Vardaman. Though I now know more about the singing voice, especially regarding the importance of intrinsic laryngeal muscles beyond the cricothyroid/thyroarytenoid dichotomy, I leave this article up as a record of my previous work. Note: Throughout this article the designation C4 is used to indicate middle C. D4 is a whole step higher, B3 a half step lower, C3 and C5 an octave lower and higher respectively. Serious voice scientists/pedagogues might be slightly annoyed by my over-simplification of some of the muscular actions of the voice. My intent with this article is to introduce some large concepts that might begin to change people’s thinking about what the human voice is capable of – without overwhemling them with information. Dr. Peter Hennen’s article, Nature’s Way: Vocal Production in Social Context (which we published in February) raises the interesting idea that gender association with specific sung pitch ranges is both an historically recent construct and a pervasive normative lens through which we subconsciously find our place in the musical world. In other words, there are basic assumptions that we have inherited with respect to what an appropriate singing range for a man is. These assumptions are so entrenched that we could live our entire lives influenced by them without ever challenging their validity. So widespread are these cultural norms that many of the best and brightest pedagogues and researchers of vocal science similarly do not question the basic assumption that men should sing lower and women higher tessiture. The manner in which a classically trained tenor, baritone, or bass phonates in the alto range is often presented as the only manner in which such pitches could be sung. Countertenors (especially the good ones) have been, for a long time, treated as abnormal, unique, and otherwise ‘outside’ mainstream thought on vocal pedagogy. It is easier to defend a system that ought to preclude the existence of countertenors by labeling them as somehow ‘special.’ I would strongly argue, however, that while certain men may be more or less genetically predisposed to succeed as a countertenor, the technique is fundamentally based on sound concepts that can be learned and adopted by most any male singer. Let us broaden the question to “what is a soprano, mezzo, tenor, baritone, or bass?” Or to put it another way, what defines someone as a “classical singer,” and how do they pick which part to sing? Certainly there is a physiological component. The inherent mass, dimensions, and flexibility of the vocal folds and their surrounding musculature do have a direct impact on a singer’s range and tessitura. However, a singer’s choice to train in a specific manner is perhaps paramount to their inherent physiology. The same human voice could be trained to sing in a variety of styles (Broadway belt, pop, thrash metal, choral, operatic, tuvan overtone throat singing, Bulgarian folk belt, etc…). We are not inherently made to sing in one way, but each style does require a slightly different physical approach. Excellence in one style often requires closing off other physiological possibilities. The fact that one woman may sing as a soprano and another as a mezzo is based primarily on genetics, but assumes that the singer has chosen to train for a style of singing that makes such distinctions. The human vocal mechanism is a remarkably complicated thing, allowing for a wide variety of sung and spoken timbres throughout a large frequency range. Any sound made by the human voice is the result of many muscle groups acting in a coordinated manner, and I will be the first to admit that the description that follows is a simplistic overview meant to introduce concepts without overwhelming the reader. How (or whether) we apply this information to vocal pedagogy is a separate topic for another day. I believe that today’s classical singers use an Optimally Antagonistic Vocal Technique (TM). The human body is able to move by use of a muscular system comprised of – in the most basic sense – pairs of opposing muscles. Your biceps, for example, lift your forearm. The triceps, however, are required to perform the opposite action. You can engage (shorten) the biceps with anywhere from no resistance to a prohibitive amount of resistance from the triceps; they act as an antagonistic pair. This grouping of muscles into antagonistic pairs is found throughout the body, including the muscles of the larynx itself. The vocal folds are a part of (some say a portion of the outer surface of, some suggest they are unique structures… whatever) the Thyroarytenoid muscles (TA). The TA muscles originate at the front of the larynx (at the inner surface of the thyroid cartilage – a fixed structure) and insert at the back of the larynx (into the Arytenoid cartilage – a mobile structure). That means that when the TA muscles contract, the vocal folds are made shorter and thicker as the posterior (back) end of the TA is pulled forward. The Cricothyroids (CT) act antagonistically against the action of the TAs, lengthening the TAs (and thus the vocal folds) by pulling back. 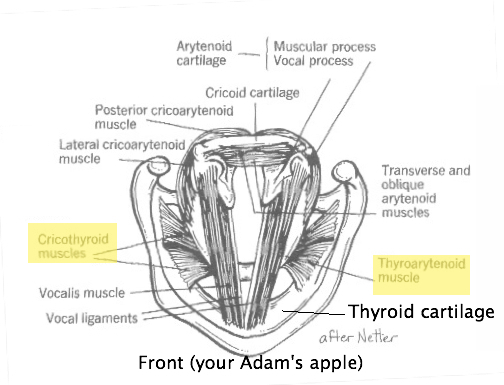 The CT muscles also slightly change the orientation of the thyroid cartilage to the cricoid cartilage, providing even more of a vocal fold stretch. Here is where the process gets interesting. The TAs want to make the vocal folds short and thick while the CTs want to make them long and thin. Shorter and thicker vocal folds are better able to vibrate low frequency pitches as more of the vibrating muscle’s mass is involved. Longer and thinner vocal folds are better able to vibrate high frequency pitches for the opposite reason. Without the balanced antagonistic effort of the opposing muscles, however, both actions would lack sufficient tension to produce an efficient, loud, and pleasing sound. Think of a guitar string: If the tension is too low, the sound is loose and inefficient. Likewise, in an Optimally Antagonistic Vocal Technique there is always an element of the opposing muscle group involved regardless of whether the vocal folds are long and thin or short and thick. This added tension keeps the vocal folds taut, allowing them to form a tight and efficient seal when they approximate (come together) and touch as they vibrate – this touching of the folds occurs hundreds of times per second (faster as pitch frequency increases). The relationship of dominance between these muscles determines the specific length and consistency of the vocal folds, thereby directly affecting their mass. Were one to hold this antagonistic relationship in a static proportion, their functional singing range would be quite small. As pitch frequency increases (higher notes), the TAs must cede dominance to the CTs and vice versa. For every pitch there is an optimal balance between these two muscle groups. There are also sub-optimal balance choices that are sometimes quite expressive and musically useful. A singer, however, has very little active control over these muscles and the efficient balance between the TAs and CTs is primarily the result of an indirect technical approach. I introduce this manner of thinking to illustrate one of the major impediments to countertenor singing, innocently wrapped up into the language of our current vocal pedagogy: The thought that the male chest voice is strong and head voice (or falsetto) is weak. If that basic assumption underlies the indirect approach taken, the result will be exactly that. The chest voice will exhibit an optimal CT/TA balance while the head voice will not. Strong and weak are, to a large degree, measures of the efficient management of the mass and tension of the vocal folds, not qualities necessarily tied to vocal registers. I think that Dr. Hennen’s research would bear out the statement that a women’s ability to more easily bridge the gap between chest and head voice is due, at least in part, to a lack of shame felt at making a “culturally feminine” sound. It is interesting to note that a higher percentage of countertenors are gay than the ratio of gay men to the general population. I suspect that research will eventually show that there is an element of the way that gay men relate to our current gender norms that gives them the freedom (permission?) to experiment with making non-gender appropriate sounds. In other words, there is nothing physiological that links gay men to the countertenor voice, it is just that more of them try in the first place. But What is a Vocal Register? Much of the language of our vocal pedagogy comes from the time before invasive scientific tools. It was as recently as 1854 that Manuel Garcia first viewed the vocal folds (his own, actually) in action with the use of a dentist’s mirror. By that point, words like chest, head, mixed voice, and falsetto (terms generally based on the location of the sensation of sympathetic vibrations) were so ingrained in the minds of 19th century voice teachers that the new information revealed by this direct scientific observation was made to conform to that basic conceptual system. Don’t get me wrong, those words – paired with examples from a good teacher – generally work to educate standard voice types. The number of great singers today attests to that fact. However, I would suggest that each of those words actually describes the intersection of two phenomena: The balance of dominance between the TA and CT muscles, and the vibratory state of the vocal folds (the ‘register’ if you like). 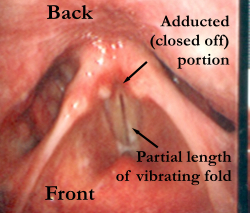 There are four basic ways that a singer can vibrate their vocal folds. Each of these vibratory states allows for a wide frequency range of sung pitches without changing the basic organization of the CT, TA, and surrounding muscles. From the lowest to the highest frequency pitch ranges these are the fry, full fold (my term), partial fold (my term), and whistle (generally only women). I use the term partial fold to describe what is ambiguously called head voice or falsetto (in women’s voices the phrase ‘middle voice’ is often thrown around as well), as the term indicates the physical state of the vocal folds and carries no indication of intensity or efficiency. As interesting as the fry and whistle registers are, they are not particularly relevant to the countertenor voice. (If you would like to read more about them, there are decent articles on Wikipedia: Fry & Whistle). Partial Fold Vibratory State (a countertenor voice in action). Note how taught and parallel the folds are. The vibration of the full length of the vocal folds, as you might guess, characterizes the full fold vibratory state. This is the vibratory state that most of us use when we speak. It is most generally called chest voice, modal voice, or in a hideous display of prejudice through word choice, normal. In both men’s and women’s voices this vibratory state can be optimally used up to about E4 or F4 (above middle C). Some schools of thought separate this shift-point of efficiency by voice type, but that is a good approximation. To efficiently sing higher frequency pitches, classical singers (Optimally Antagonistic!) switch to a second vibratory state: the partial fold. This is accomplished by means of a few observed mechanisms. Generally, muscles either come together to close off (adduct) a portion of the back of the vocal folds (see photo above), or the back of the folds are held apart, again leaving only the less massive front portion of the folds vibrating. The second option is observed in female singers in particular. Whatever the mechanism, the result is that the now shorter vibrating portion of the folds is able to vibrate much faster (higher pitches) than the more massive full length of fold. The degree of shortening of the length of vibrating fold also changes to accommodate higher and lower frequency pitches. The balance between the CT and TA muscles is still very much in play in this vibratory state, creating a multi-variable environment for eliciting the most optimal length of fold and degree of CT/TA dominance. (Actually, it is even more complex than that: There is the additional variable of the depth of the vibrating surface of the folds. The full fold vibratory state tends to elicit the greatest depth (called vertical phase) which results in a rich and loud sound. Vertical phase decreases in the partial fold vibratory state, though in most male voices it decreases far more significantly than is physiologically necessary.) If you want to experience the difference between these vibratory states, try this simple exercise. Sing a crescendo and decrescendo over several counts (a messa di voce) on a G4 or A4 in your full (chest) and an Eb4 in your partial (head) vibratory states. Play around with crescendoing until the action fails and you have a yodel-esque break. The voice will switch vibratory states in an attempt to let you continue vibrating on that frequency without hurting yourself. Obviously E4/F4 is just an approximate optimal pivot point for switching vibratory states (registers), not a hard wall. The balance of CT/TA dominance appears to be similar enough at this pitch frequency that a trained singer can switch vibratory states without much of the yodel flip. This is one of the wonders of – and from the perspective of a pedagogue, somewhat annoying qualities of – the human voice: It is amazingly tolerant of inefficient use and will function expressively right up to the point that it catastrophically fails. One can sing super-optimal frequencies with a full fold (think a dramatically loud high Bb for an operatic tenor or G for a baritone). The opposite is also true: one can sing pitches below F4 on a partial length of vocal fold. In each of those cases, the CT/TA dominance is dissimilar enough that it is difficult to fluidly switch vibratory states mid-phrase. The implication of this for countertenors is very interesting and illuminating of the typical short comings of the voice-type. It is generally accepted that countertenors sing the range from B3-E4 in a sub-optimal manner, which is to say they sing on a less massive, partial length of vocal fold. If one is taught to believe that an optimally antagonistic relationship between the CT and TA muscles only exists in a full fold vibratory state (chest voice), it will be tough to make the partial folds vibrate with the CT/TA balance necessary to create a loud, clear, and consistent sound. Some countertenors are able to sing as low as a G3 on a partial length of fold (Andreas Scholl and I come to mind). Others have to figure out how to switch back and forth between a full and partial vibratory state at what is a sub-optimal frequency for the change. This is easier when the low pitch is isolated – a note that you can pop down to (L’empi-o, slea-le, indegno); it is much more difficult as a part of a legato line, or in the midst of step-wise coloratura. I would suggest that all countertenors experiment with building a more optimally antagonistic action into this lower partial fold range. It will save both singer and audience members the struggle of constant gear changes. Right… But How Do You Sing So High? As challenging as the lower end of the male alto range is to master, what most people remember is how high a countertenor can sing. There is nothing particularly interesting about how we do this, as the mechanism is very similar to how women sing in the same range. In an optimally used partial fold vibratory state, as pitch frequency increases, the vibrating portion of the vocal folds further shorten. There is a drop off in the air pressure required that corresponds with this phenomenon, and countertenors would be wise to learn to incorporate this. (Do not confuse this shortening with a release of the CT/TA antagonism. The CTs are often pulling quite hard in this range.) Empirical evidence suggests that these shortenings take place around Bb4/B4 and E5/F5. Many countertenors ‘top out’ at one of these frequencies, or just beyond. Some singers are limited by the mass of their folds – no matter what, they will not be able to optimally vibrate higher frequency pitches. Others could increase their range by fixing inefficiencies in their technique. Some countertenors are able to sing remarkably high frequency pitches (C6 and beyond). My theory on these men (having sung with several of them in Chanticleer) is that their vocal folds are simply significantly less massive than the average tenor or bass’. Their speaking voices tend to be higher in pitch, and their full fold singing voices tend to have a lower frequency pitch limit similar to a female’s. Other countertenors are able to sing very high frequency pitches early in their careers, but they slowly lose that range over time. This is caused by two aspects of the aging process: 1) The human larynx doesn’t fully mature until the mid 30s, and 2) later in life the CTs are eventually unable to pull hard enough to vibrate that fast. Parts of the voice can burn out over time, especially (but not necessarily) if the singer’s technique was sub-optimal. This is a very simple overview of countertenor technique. Further posts will outline other equally important elements of the technique such as breath energy (I like that word better than support), cultivation of the singer’s formant, the depth (not just length) of the vibrating portion of the vocal folds, and the low laryngeal position needed for the CT and TA muscles to efficiently function. X-factor – the result is something that is athletically revelatory of the best in the human spirit. It can be graceful; it can be raw and powerful. It is super-normal by definition. Of course, there are gradations of this. A man singing alto in a mixed choir, or one who uses a microphone with a new music ensemble may never have to develop the amplitude and associated vibrato necessary to cut over an orchestra. Is this man a countertenor? Certainly choral sopranos are sopranos regardless of whether they ever opt for the most efficient and antagonistic approach available to them. But, every man who sings some pitches in a partial fold vibratory state is not necessarily a countertenor. In such cases, I would ask that we expand our definition of what a male voice is generally capable of to include a strong partial fold vibratory state. Should a countertenor train like a male singer or like a female singer? There are aspects of both approaches that are worth incorporating into a countertenor-specific pedagogy. As I mentioned above, optimally antagonistic female singers spend a good deal of time utilizing a partial fold vibratory state, and it is useful for countertenors to mimic the manner in which the vibrating portion of their vocal folds further shorten as pitch frequency increases. On the other hand, a countertenor usually has access to a much more massive full fold mechanism than a female singer does. This can be advantageous when trying to get feel for a balanced CT/TA antagonism in the partial fold vibratory state. Exercises can be crafted that elicit this balance with the full folds, immediately sliding up an octave to the partial fold with the goal of preserving the same set up in the new vibratory state. More fully understanding the vocal mechanism in this manner – and critically questioning what we mean when we talk about singing – can lead to an approach that is well crafted specifically for countertenors. Success as a countertenor is no more or less physiologically likely than for any other voice-type, provided we have conceptual models that encourage singers to believe that it is possible. I’m a countertenor able to sing in soprano range. My voice comfortably sits from about D or E 4 to B5. My real range is from Middle C to D6, but once I get to the D or above I’m practically screaming. One of the things that I’ve struggled with as a countertenor, is trying not to sound too hooty or too much like a little boy singing. I find the hooty sounds to be ugly and the little boy sounds usually build tension once I pass E5. I was just wondering if there was any techniques that could help me find a common ground with the hoots and boy soprano sound. I guess I’m basically asking for tips on how to make my falsetto sound like a talking voice. Great article. It’s quite revealing. I am a Tenor and I am wondering how difficult is the transition to be able to sing CT. I think it’s basically more cry muscle activity involved in the sound production, also less twang (pharingeal resonance). Basically a different fomant tuning resonance strategy. The mouth will be more vertical, I think. Especially below F4, you’ll be using a more neutral approach and less chesty chest. It helps to start with deliberately letting your voice “crack” or “flip” into falsetto. You can hoot that sound with optimal support from the stomach and back muscles- make it very loud! But it will always feel like you are on helium, with the sensation of the sound being underpowered despite the apparent volume. I liken it to “singing underwater”. It has that kind of disembodied, softened, hollow pidgeon-like tone. You can add more twang if you like, and it will sound more like underpowered chest voice- a very thin, swimming sound. You can also distort it by twanging harder. All three types of tone variety can be connected to your lower range, and that is accomplished by supporting the tone from below. My story is long, I’ll try to make it short. When I was around 14 the elementary school choir teacher asked me (in junior high) to join his choir even tho I was older because according to him my voice wasn’t going to change really much. That scared me for life. I’m recently 22 and I love singing since forever (to contribute to your article I did always liked to sing along tunes by mezzos when I was growing up and I have to press really hard to feel my Adam’s apple, I literally don’t have one to the naked eye). I’m really ignorant when it comes to musical theory but the little I know about my own voice seems to meet pretty much all the descriptions you made in this article, my limitations, etc. I’ve never tried to even get close to operatic music or classical training, I’ve been too chickened to do it. And I think the result of it all has made me “acquire” the voice of what some people have tried to call “male mezzo” haha. I can reach some highs in the 5th octave, but this are pretty weak and unsustained. I can go as low as A2 if I whisper (and I just discovered that recently). My “comfort zone” resides pretty much inside the 4th octave and I have horrible problems with staying on right pitch and singing falsetto. The only teacher I’ve had. almost 6 years ago, (the one I mentioned above) used to say my pitch problems are derived from my hard to control-vibrato and that countertenors very rarely have a useable falsetto. So I coped with that. But I just really wanna know… what really am I at this point? What can I become? How can I do it? etc… is not like I honestly have the money to afford a vocal teacher etc. So I’d be forever thankful for your help. Here’s my souncloud https://soundcloud.com/diego-a-m and being the shy person I am I would like you to listen those recording I’ve gotten more positive feedback from, like “Stomach tied in knots”, “Hysteria” but please listen to whatever you think you may like, haha. That is, if you can. And to be completely honest. I used to be really self aware of me “singing like a girl” because of bullys and stuff but at this very moment I would like people to like the voice I really have, even if it’s “girly” I really like it and I really passionate for singing. And I would never change it for a bass/baritone/tenor voice if I could. Thanks for your blog. It’s seriously one of the very few (if not the only) place on the net with info about counters and it’s really a great one. Hi there, I hope you will see my message . Certainly you have smaller larynx and vocal folds than the statistically prevalent fachs of bass baritone to tenor male voices, but that doesn’t mean you can’t achieve a fuller voice and expand your range. By that I don’t mean sounding more “manly”, as your high voice is simply a peculiar characteristic, which doesn’t make your voice a lesser one just because you are male, it bugs me to no saying when people say that. You can certainly get more powerful high notes, especially as you are advanced by both fold size and resonance in that, indeed, smaller larynx naturally emphasize the higher harmonics which enrich the high range. You can also gain more low range and firmier and fuller lows, as you say you enter into whisper, so you have to work into twang and adduction. Of course, despite you can get fuller and pretty decent lows, you won’t have the resonance for Barry White like lows, as can’t I, and I’m a baritone , because the laryinx resonance space can only get so big by lowering it. You have to transition to the strohbass register. Low voices also lack the same natural brilliance and resonance in high notes, but they can come close to them. I admit it’s an advantage, though that the high limit is easier to overcome and the more tension necessary for low voices to reach higher notes, although needing harder work, naturally harbors energy in itself. While slackening to reach lower notes has a more subtle energy, which comes from a decrease of energy. You have a very nice voice, but for now it’s a bit unsupported and out of tune. You probably need to work on support. Hi i’m 18 years old and I can reach a G5 in CHEST VOICE, i was training with some Mariah Carey’s songs and i developed a technique to reach tht notes effortless, at the beggining it was difficult but with some coach help i started to reach that notes. I know that i’m a counternor but i want top know why i can go higher with my head voice,with falsetto i can reach til A5 but higher i can’t, I’ve been trying with opera technique but is useless for me. Hi, well, how does your voice sounds when you talk, how low you can go and how does it sounds? About chest in G5 at most you could mean very light coordination, because not even sopranos can utter a G5 in pure chest . while waiting for Ian’s response (I’m also curious) I may tell you my impression, based on what I know and what you told here. lighter sounds than usual “full” voice and not necessarily true reality. lower falsetto, how you call it. Less extreme graduation, probably mimick an extremely short set of folds for very high notes like the ones you are doing. Ian, how do you feel about how tenors do their High notes approaching high C, is that partial fold? retaining the edge of full voice, without being really “full”. when not having to keep the light baroque tone? it’s convincing in that respect. I’m a baritone singer, but I have a very powerful falsetto and mix. I can sing up to E6 (usually only D6 but sometimes I can hit the E) and it doesn’t sound bad, or so I am told. I’m very curious because I have an issue that feels to me like I have two falsettos. I have what I refer to as my lower falsetto which overlaps with my chest voice range, and goes up to ~Tenor C. Then I have another falsetto, which feels a completely different part of my voice and goes to that E/D area. It doesn’t go very low, though, so there’s an area that I believe I don’t know how to hit. (I assume I physically can, but I don’t know how to sing within that range. If you could help me with that, that would be awesome, but my true question here is…)I can’t seem to produce consonants. If I try to sing words in that higher falsetto, the sound falters and goes away and I would really like to be able to make use of those high notes.Thanks, Nick. How do you keep your great volume dynamics with the partial folds? I ask this as they are a result of hyperabduction (the arithenoid pic) and as apparently low volumes comes from a mix of voluntarily scarce abduction, that i know, how do you avoid flipping as you unabduct your folds? As for the age limit I think that however genetics may help, a good technique helps more. A F5 at 70 during a lesson. La donna è mobile very recently, at over 90. Sounds like his CT still really pulls more then enough. In the lessons he says something about thinking about falsetto, depending on what we mean with falsetto this might not sound correct, especially when he says soprano use falsetto, this is not obv relevant on how good he teaches, especially talking about 20 years ago and from a generation like hi’s. But probably his falsetto example is just “mezza voce” or “messa di voce”, not the usual falsetto people usually break into when attempting like notes, that kind of falsetto can definitely be pushed, while only a correct “messa di voce” is not pushed by definition. What do you think about all this? So, while we do associate the vocal balance with the balance of chest/head-falsetto (TA/CT muscles) the fact is they can be balanced in two ways, (inside) the full fold and the partial fold function. A countertenor uses the balance in the partial fold function. While a let’s say baritone uses the same balance (or muscular development) but full fold…Am I correct? Another question…How rigid are the full and partial fold phonation? Are they deffinitely two different phonation modes, or are there certain mixes between them? Or to put it more colorfull…is it all black or white (either ff or pf), or are there shades of grey between them? So all this has been scientifically backed up, observed and so on? I am fascinated! Because it almost seems some teachers almost *want* to stay uninformed. Also, what is with women? There are numerous cool recordings by the amazing Eileen Farrell where she sings both opera and jazz. (For example Wagner vs. My Funny Valentine) She is obviously vocally balanced and excellent in both…But is she singing with full fold function in My funny Valentine and partial fold in Wagner? Thanks for clarifying and keep up the good work! Thanks for this comment. I don’t think you quite have it. The ff and pf describe vibratory states. Many pedagogues would describe the difference in terms of vertical phase alone, and others incorporate vibrating length as well. Within any given vibratory state you can sing with any degree of optimal or suboptimal vocal fold engagement. The vibratory states themselves are consistent, and are not the same as saying “head voice” and “chest voice.” The qualities of head and chest are an intersection of the vibratory state and the degree of optimal antagonism. Although… it is, of course more complex than this . My experience is that countertenors tend to not make great baritones, perhaps because of something inherent to the instrument, but likely because of choices made over time. Hi and thank you for your answer…my confusion was because some consider the degree of antagonism where CT is dominant head voice, and TA dominance chest voice. Independent of the vibratory state itself, ff or pf. I know that in another place you wrote that some wrongly link pf as head, and ff as chest…But there are also those who link the muscular dominance alone with head and chest, independent of the vibratory state they are usually unaware of. (the school I come from) That is why I had a difficult time to explain to my (ex) voice tecaher that I feel the lower region of my countertenor voice (the partial fold) as chest voice as well (but a different one from the full fold one which I use during speaking), because inside the partial fold, the lower region has optimal antagonism where TA is dominant. Or at least I feel it as dominant. And in this school of thought, the TA dominance = chest, independent from vibratory state. A baritone or tenor would I suppose need to stay in the full fold in ascending, but just change the optimal antagonism, the so-called covering…What keeps the sound of the chest voice all the way to the top. And in that light some call the male pf falsetto…because of what, it might become understandable why some have said that falsetto can “damage” your full voice, if you’re lets say a baritone. Because it would make you constantly switch between the ff and pf function, in the range you want to have ff, but with CT dominance (covered). For the same reason why making a countertenor sing as a baritone in the upper range might interfere with their progress singing as a countertenor. It’s I suppose just the question of how you choose to sing – as a countertenor or as a baritone for example. But I agree that the old system is sort of confusing, because it is not precise enough to explain what happens. And because the same term, like head, can mean a few very different things. Great article! In your experience, is it possible for a CT to regain their upper head range post smoking. I know I am telling on myself, but my concern outweighs my embarrassment. I used to have a very pleasing extension up to F6 (when I was a late teen), and although I know I will never get that back, is it possible to rehabilitate back to a “healthy” CT range? I am still capable of C5/D5 notes, but they have a more chesty, tenor, and almost forced sound to them. Any advice/tips you could provide would be greatly appreciated! Thank you for your time. Hmmm… That is an interesting question that I have not thought about before. If there are any voice doctors lurking around here, I would defer to them, but I assume that given enough time (and assuming good training), one should be able to heal from smoking damage. The real question would be whether you are training the range through c5/d5 in a healthful manner. If you perceive it as “more chesty, tenor, and almost forced…” I would assume that you are pushing the folds together too hard and using too much sub-glottal pressure. Can you try to do low to high sweeps placing the back of your hand over your mouth? The goal is to allow only a small amount of air to escape around the sides of your mouth. This will create ‘back pressure’ that prevents you from pushing too hard . I have this EXACT issue. Will try what you suggest here. Thanks so much! I am a fellow countertenor and enjoy very much your article, it is about time for people to hear from the real countertenors what is and what to feel when you sing as such. I am studying voice right now, although I am older (41) I still sing on the range of a mezzo. At school (San Bernardino Valey College, California) I have run into many young men that heard me singing and want to know what they can do to learn such a technique, this article is for sure a great source of information. Question: Do you have any school that you would recommend for futher studies as a countertenor? a place where one can learn from other countertenors? Thank you again! by the way, love your work! You raise an interesting question, one worth thinking about. Namely, is a countertenor necessarily best served by a teacher who is a countertenor? My sense of it is that one shouldn’t immediately presume yes. It would depend on whether the teacher has a solid sense of pedagogy and understands the subtle ways in which a countertenor should train differently from standard optimal vocal technique. I have taken lessons from a few countertenors, but all of my long-term teachers have been women. That being said, if you want to be in an educational environment that would surround you with other countertenors, Indiana University & McGill University come to mind. At various times Westminster Choir College has had a number of countertenors, but my sense is that the voice type isn’t particularly courted there. I am going to be doing doctoral work at the New England Conservatory starting this fall, and there are always a few countertenors going through the undergrad and grad programs there. I know this mechanism under the name of Stop Closure Damping. Would you say that by shortening just a bit of the vocal tract a bass may emulate a a sound similar to the one of a tenor in the high C? Note that i simply said “similar”. Some singers are limited by the mass of their folds – no matter what, they will not be able to optimally vibrate higher frequency pitches. ” but you also said a counter tenor can even be a bass or baritone, I heard of bass people able to sing queen of the night. I think I am a baritone, maybe even a light one, I am just curious about this. To your second question, remember that the inherent mass of your folds can still be dramatically decreased by singing in an alternate vibratory state (head voice). Within your chest and head vibratory states, you will be able to find a point past which you can vibrate no faster (preceded by the point past which you cannot vibrate faster in a healthful manner). So, it is not paradoxical to me that many countertenors are basses or baritones. Thanks for your very fast answer, I’m glad of it. Oh, I said “vocal tract” my bad, what a lapsus. Well I meant vibrating tract, shortening of the vibrating portion of the fold you illustrated, that matches the “damping” description. So, i asked if by shortening this tract just a little bass can achieve a high C similar to that of a tenor, just like when he usually sings high in the “mezzo or alto range he achieves a similar quality with your method, because he shortens the vibration more. So I figured he could “match” a tenor if he zips up the cords less than it. So now I get what you meant. Yes you were referring to the voice achieved with just TA-CT antagonism, obviously that way most basses will have hard time going above E4 above middle C, F4 maybe with “mixed” voice. I agree, so, they will have to reduce the mass zipping up the cords as you said. I have some doubt about “mixed voice” though, that i know there are different gradients of mixed voice as you ascend, once you ascend simply by increasing the antagonism TA-CT, you start to dial down the TA and give less chest, the cord vibrates still in its entirety and this is optimal until you approach the canonic highs of you voice type. Then it is wise to transiction in “damping”, am I right? With mixed voices i read the two armonic components of the voice, muscle and cover start to get offset, the muscle contributes less and less. Do you know Joseph Shore? He is a verdian baritone, and given his timbre I have little reason to doubt he’s a closet tenor, he is capable of easy high A-B-C-D! I’m authorized to suspect your damping system is involved. I’m also doubtful women have the same passage point, maybe the Altos with the Tenors, but take a soprano or a light mezzo, high C is nearly central, especially for a soprano, I take that they have a easier transition as smaller cords require less blow pressure to vibrate, (like a smaller lens of a microcamera has little need for focal accomodation) so that I may think they have difficulty with their chest register, hence the trouble in singing lower than C4 with volume. But Soprano’s tenor C is almost only “chest” to me reachable with simple antagonism, the muscle part of soprano’s voice is high in itself, that i know, unlike lower voices. So I’d say their really need for mixing is just above this note. The term “mix voice” is a strange one to me as it seems ambiguous with respect to vibratory state. I think that what is meant is either a full fold CT dominated or partial fold action with a proper CT/TA antagonism. I don’t use the term to describe my voice, and I don’t use it to teach. I do think that men and women have the same passage point, but women’s voices simply “fail” better above it. This is just a matter of mass management. Thanks, you’re very kind. I grasped the dinstinction, you can go up to A4 with CT dominated full fold, or optimal CT/TA antagonism with shortened vibrating fold. I’d like to be able to do so. But take thise examples, is late Pavarotti high C full or partial fold, for example Tito Schipa had a much more relaxed high range, Pavarotti is the display of force, but sounds full. Stevie Wonder sounds very easy and also sounds like he shortens, Adam Lambert sounds like he shortens too and can sound full up to B5. They are all tenors “unfortunately”, though. 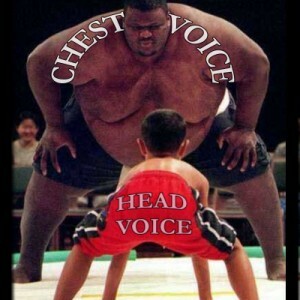 What I mean that antagonism may be variable even with proper relationship with CT-TA, “chest” voice has an optimal relationship between the two, but as the pitch raises the antagonism increase, so it is the time to begin dialing down a bit of the TA to keep the antagonism at bay, this might happen as soon as B3. So the mixing is a compromise to keep the full chords from excessive antagonism. I’m a haigh baritone, I think. Do you think that when I sang that round, full, effortless G4 I may have used a bit of that partial cord mechanism without knowing? If I didn’t, I’d say that dialing down the chest up to that point still delivers a good balancement and then full fold mix may sound good to that point. You said everyone can get to B4 without switching to partial folds, I’m not so sure, you mean with excessive effort and with bad sounds? But as I understood, you don’t have to wait to B4 to engace partial folds, especially if you are in the bass-baritone category. Some can be in “stop closure” as low as G3. And I know it is not “your” mechanism or “your” voice, luckily you are not the only one, even as good as you are. Inspiring stuff Ian. I’m a self-taught Baritenor (I find I’m comfortable somewhere in the middle, though mostly tenor) whom performs at my community theatere, and I was told to audition for Mary Sunshine after some directors witnessed my powerful falsetoo in another show. It blows my mind though-people keep telling me I have the potential to sing CT, but I find I can’t sing really high notes quietly though-hence the word “powerful”. Is this something I can remedy? Are teachers easy to find btw? I haven’t ran into a single CT in my area. A.C. it gets easier as you improve your technique. I found the same thing when I started. My upper range was limited and my highest notes could only be produced at one level — loud! As I’ve improved my technique the high notes start to feel less high with greater dynamic control and more notes become available higher up. At this stage in your development I would recommend focussing on finding a good voice teacher who is willing to teach a countertenor and willing to learn as well. My voice teacher was a soprano who had never taught a countertenor before and I learned a great deal from her. In the beginning, it’s most important to have someone who really understands voice and how to teach it and with whom you work well. You can worry about training with a countertenor later, if you feel you want to. Dear A.C. I concur with Allans comments; awareness that you wish to sing high/quiet is often the first step towards acquiring the technique. You may also wish to read this article: http://blog.counterpointspublishing.com/2011/07/vocal-technique-the-flex/ It covers a specific exercise that can build stability and ease into your countertenor voice. I also agree that countertenors are not always the best teachers for countertenors . I don’t think that I have ever seriously studied with one (outside of masterclasses). If you can find someone with a solid understanding of breath, onset, and clarity of tone, who is also willing to learn how to teach a countertenor, you’ll be fine. I am not able to find any suitable teachers where I am at. Most women don’t want to teach men because they feel that they are hurting our voices. Men will typically try to sing me down in my tenor range. I have given up with teachers so far. We have no professional countertenors here in Arizona that I can tell. I try reading your articles and I get lost on the musculature discussions. I feel for you Chris. It is hard to find a good teacher, even in major cities. I have emailed a singing friend who just moved from Arizona to get some suggestions for you. Can you send me a message through the contact link above and give me your personal email address? I would be happy to pass along whatever suggestions I get. The musculature is confusing! This article is meant to lay the conceptual groundwork upon which my subsequent articles are based (have you read my flex article?). We have to change our thinking about the voice before we are able to use the instrument in a new way. Simply understanding the musculature does not make you a better singer, but it can give you information that allows you to make better choices in the future. I remain unimpressed with the quality of Skype/iChat for teaching lessons online, but I could give you a consultation through those means if you are really stuck for a teacher. I tried to read through some of flex material but either I am having an issue understanding it all or I am just overwhelmed by all of it. I would think that singing would be easy but from what I have seen out there, it isn’t. My favorite is to sing from the diaphragm. I tell those people if your diaphragm could sing then it would work, but in reality your cords do all the work. The diaphram controls only the air flow and amount of air. Skype is not great in quality but it is still a good resource. I would consider doing a video lesson with you but we need to discuss cost. You can email me and let me know. Find Dorca Cobian in Arizona (Phoenix area), She is very open to work with countertenors. Thanks for this article. I’m an aspiring composer and countertenor, and this definately helps me make the decision to switch up to countertenor from the baritone that I sing in in modal voice. You mention above about doing the “reverse” phonation technique (i.e. breathing in while phonating). I have done this before and have gotten from G6 to G7. I would like to be able to squeak these notes out the normal way. Hmmmm… where did you see a note about reverse phonation? Don’t know now! I am sure I must have read something to that effect. Basically breathing in while producing a sound. Sure, sure. I had a teacher that had me briefly inhale and phonate on [ü] before executing other exercises. Here rational was that doing that ‘sits’ the larynx into a low position. I’ve since stopped doing that, but it was interesting for a while. How are you using it? When I first learned of this technique it was in High School. An American Indian friend showed me this and it was amazing at the wall of sound he produced! It was only about a year ago I tried it for singing. At first I was able to hit notes above F5 and now I can sing notes normally above F5. I do it now and I get squeaks out at G6 and once I got over C7. I think it helps train the musculature to position the cords without pushing too much air. In order to accomplish these notes, now, would require me a lot of air and that would probably not be good. That is how I use it. I am wondering if you could clarify something for me. I would like to know more about the relationship between the male “falsetto” and a woman’s “head voice”. I know the four vocal registers of the human voice recognized by speech language pathology, and I’ve found people saying that they occupy roughly the same ranges for everyone, and other sources saying they don’t. I’ve found people saying that the male falsetto and the female head voice are the same vocal function, and others saying they aren’t. Can you shed some light on this? Thanks for this great question, whether male “falsetto” and female “head voice” are the same. I think that the reason that you’ve found so many conflicting answers is that the word “falsetto” is imprecise and is used to describe a variety of physical actions, most – but not all – of them inefficient and weak. Some people will use it to describe an airy sound produced without much TA engagement. Some people use it to describe any sound made by a man on a shortened length of fold. I think that a man can train his voice to sing in a manner physiologically similar to a woman’s “head voice,” and that is what good operatic countertenors do. There will tend to be more laryngal tension involved for the man, as he likely has a more massive larynx, but the vibratory state of the vocal folds is, I think reasonably similar. Remember, there are a variety of approaches used by women when singing in their “head voice” as well. To label a man singing in this action “falsetto” just because he is a man is, I think, pedagogically useless. That is why I advocate describing the vibratory state of the folds separately from the degree of CT/TA engagement and vertical phase. I would ask the question, “Is a partial fold vibratory state the same for both men and women?” I think that the answer is yes, but most men either have too much laryngal mass or have never properly trained the muscles to produce a healthy sound in that range. Your other question is about whether men’s and women’s vocal registers change at the same pitch points. I believe that the answer to this is also yes (although as the article suggests, these pitch points are only suggestions… the voice is capable of stretching those limits), but that the inherent mass of the vocal folds dictates whether any given singer will be able to phonate well in any specific part of their range. As I wrote above, men often have too much mass to vibrate fast enough to produce extremely high frequency pitches, even if they were to use their vocal folds in the most optimal manner possible. So, there are a number of factors, each with its own possible range of variables, that contribute to how men and women are able to use their voices. Though the fundamental physiology is very similar, the results can seem quite different. For example, both men and women can ‘belt’ up to Bb4s without shifting to a partial fold approach. A woman will often sound better doing this than a man because her less massive vocal folds are better able to take the strain. That doesn’t mean that her “chest voice” is higher, just that it is better able to function in a super-optimal manner. I have to say that seems like the most consistent approach I’ve seen to this. This matches with my own experience and makes sense to me. More than anything as a singer and a teacher, registers are the bane of my existence. I must say that the view you take matches closely with what I already thought. I just needed confirmation that you were saying what I thought you were saying. It’s nice to know that I’m not alone in this. I also wonder about the reduction in pressure you talk about. Does this have anything to do with the abdominal support, or should those muscles remain firmly engaged? How would you train this? I can sing up to about an A flat (about a G if I need to sing it for any length of time) and my voice teacher (I’ve moved and can no longer take lessons) said that she can even hear the possibility of the whistle register in my voice. I feel like there’s a lot of pressure as I get into the very top of my range, so I wonder if this is the next step for me to work on. I’d like to, but I’m just not sure how to go about doing it. This is a tough question to answer as I don’t buy the assumption that one should actively manage breath pressure 1) really at all and 2) via actively engaging the abdominal muscles. I am working on an article addressing issues of “source” versus “results” oriented technique, and this is a great example of how focusing on the latter can produce inconsistent results. When we breathe in, several parts of our torso are engaged. Intercostal muscles in the rib cage lift and expand the rib cage, the lungs respond by filling with air, the diaphragm drops to accommodate the filling lungs, and our abdominal organs shift down in response. This is one coordinated action caused by the mental impulse to breathe in. In a coordinated and efficient exhalation optimized for athletic singing, several parts of the torso are similarly engaged. Most notably, the intercostal rib cage muscles responsible for inspiration remain antagonistically active in opposition to those that want to squeeze the air out of your lungs. Some people call this “suspending the breath.” The diaphragm and muscles of the abdomen will react to this antagonism; they will have what is called “muscle tone;” they will be ready to act and slightly engaged, but they are not causing the exhalation. This is what I mean by source versus result. As a result of a coordinated exhalation you will experience activity in your abdomen, but that activity is not the source of the exhalation. Focusing on it as though it were only confuses the body. So I can’t really address your specific issue without knowing whether the over-pressurized experience you are having is 1) something unique to those higher frequencies, or 2) indicative of a breathing issue that your voice is tolerant of at lower frequencies. You may have the ideal vocal mass to optimally phonate higher than G5, but your sub-glotal air pressure is not allowing your folds to further shorten to accommodate those higher frequencies. Have you tried the exercise where you breathe in and phonate quietly on [a] with no compromise. In other words, just let air pass until the [a] happens. Do not force it, do not compromise to make it happen. You should be able to sing those high frequency pitches quietly in this manner. If you can’t, this exercise will show you what you are doing to try to force the action, thereby indicating what technical issue you need to work on with a teacher. I suppose I oversimplified my question by just saying abdominal musculature. I have made a fairly significant study of breathing, so much of what you had to say I already am familiar with and agree with. I get the impression that this is an issue that is very difficult to deal with in words, but I appreciate your attempt. I think I have a better sense of what you mean now. I hope that others will also find this enlightening. That I know I had vocalized a surprisingly effortless, round and forward G4, I am sure I was mixing though. The teacher (of a choir ) thought i was a tenor but I’m almost sure I’m not. Hi Ian, I’m also a countertenor, a sopranist to be more specific. Although I’m training with my vocal coach I would like to ask you, do you think there would be a problem by starting singing as a countertenor-mezzo and then shift into a sopranist? Could we exchange some musical sheets? As with many people who comment here, I’m unable to diagnose possible technical issues without hearing you. Generally, though, if you are able to sing well above F5, your challenge as a countertenor is likely going to be a weakness in the B3-E4 range. If you are pushing to make the pitches about F5 happen (and your B3-E4 range is nice and full), you likely need at address the transition between Bb4-C5. If you carry too much tension through that range, you are ‘set up’ poorly to sing F5 and above. If we can find a time, I could give you a little free 10 minute skype diagnosis? We could talk about exercises then too. I’m a little hesitant to just give people exercises as what matters is “how” you practice, not “what” you practice. You can contact me through the link in the menu bar above. I agree about falsetto it’s too much of a broad term, I might suggest it to be only used when voice breaks abruptly in a higher weak and airy note, this is wrongly identified with the limit of the optimal voice, but we know it’s just lack of training. And doesn’t this mean that the voice is just phisically lower having more mass? Isnt’ it an acoustic law that bigger masses require higher tension than smaller masses to vibrate at the same pitch? Hence why they strain more, the full folds of medium/high female voices at Bb4 aren’t definitely enduring the same strain better, they are just less rigid, like a G guitar string (letting alone fretting) will be far less strained if you tighten it via the key up to a Bb3 than the, the A2 or D3 string will be tight. A soprano full fold (no CT – TA balance shifting aka mixed full voice) might be as strained only at F-F#5. So i have to think their chest voice is actually higher. This is why I think every voice has a different shifting point talking about passages, maybe I’m wrong but apparently phisics says so. While I agree about the increased ease of higher voices especially females and *some* gay men (the latter two more for cultural reasons, as you said) ease to shift to partial fold mechanism. Also the bigger the voice the bigger the difference in mass between the vocal body and the cover (that apparently only vibrates in pure falsetto) and this is also a factor. I read that earlier Pavarotti gradually switched to partial fold mechanism to have easier high notes, the same for Tito Schipa. Pavarotti later abandoned this in favor of the mixed full fold mechanism. Is there an inbetween with partially shortened vibrating tract? Because there can be a smooth transition, see Geoff Tate (baritone), apparently. I think that any man can better their partial fold mechanism. Baritones tend to be most able to develop a usable countertenor voice. I concur. This is an excellent article. I am a music teacher and an aspiring countertenor. This really helped to clarify some of the things I’ve read before. I wonder if you’ve ever thought about writing a book on the subject of training the countertenor voice. It seems like the most treatment I’ve ever been able to find (such as in Richard Miller’s The Structure of Singing) is a brief mention, basically acknowledging that we exist and that we are not freaks. I am so glad that this article was helpful. I think that eventually I would like to expand this topic into a book, most likely with a medical doctor’s research help. In addition to the Miller, Peter Giles is the only person currently published on the topic. For my taste his approach is geared towards creating cathdral choir altos (and it is overly muddled in pseudo accurate science and metaphor). I will continue to work out my thoughts on this blog, so stay tuned! Well said, Ian. This is a very well-written apt description of the functioning of the voice. I especially appreciate your widening the field of possibilities / options for the human voice. Thanks, Ian. I’m always struggling with partial fold singing in that transitional range between B3 and Eb4 – specifically, making it speak enough down there as I sing higher more naturally. This helped me understand the physiognomy a bit better. I’m so glad that this is helpful! Thanks, Ian. I think I understood a lot of it. You are a good writer.